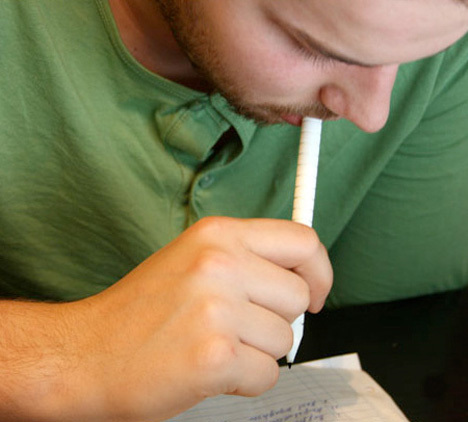 We all know at least one person who can’t resist chewing on their pen or pencil. Usually it’s a highly annoying habit that results in a lot of ugly, chewed-up writing implements all over the place. 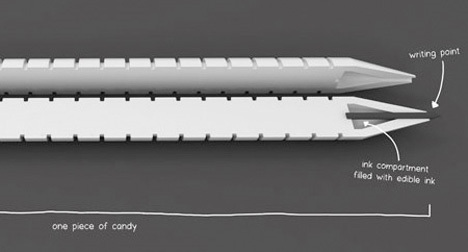 This edible pen concept from Dave Hakkens will let those pen munchers chew away with no fear of catching a mouthful of plastic and bitter ink. The pen is made of one piece of candy with indents that make it easy to chew off one piece at a time. According to the designer, the pen doesn’t get sticky and doesn’t melt in your hand. 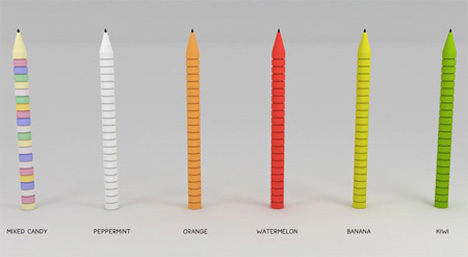 The majority of the pen is only candy, but down near the tip is a small well of edible ink. The only part of the pen that isn’t edible is the very small hard bit at the tip. When you finish off the candy, you can either throw this bit away or use it to hold an ink refill in a new candy pen. The candy used to make the pen is rather like that used in candy necklaces. The first prototype Hakkens made was peppermint flavored, but he has plans to produce the pens in lots of different flavors. There is no word yet on if or when the candy pens will be available for purchase, but for the sake of nervous office workers everywhere we hope it’s soon.